People always ask me, “How do you do it?” They want to know how I blog, do freelance work, take care of a baby, husband, and manage every day life. Trust me, I don’t have a secret. I am sure most of you do a better job than I do. I just try to survive each day with a smile on my face. 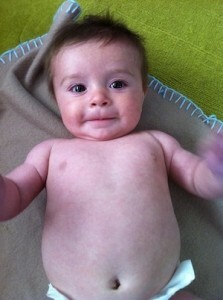 I am very grateful that blogging is my full time job so I can stay home with our little guy. I love blogging, but I love our baby even more. Being a mother is the best job! 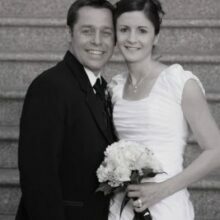 I couldn’t do what I do without my handsome husband. 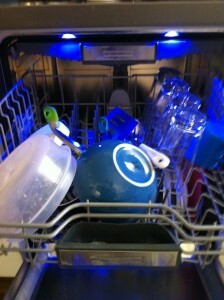 Josh is a HUGE help around the house, with the blog, and with our sweet little pea. 5:00 a.m-I hear Caleb crying so I go to the nursery to feed him breakfast. It usually takes him about 20 minutes to eat. I usually check my emails, Twitter, Facebook, etc. 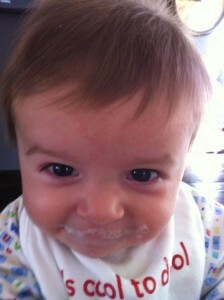 on my iPhone while he eats. 6:00 a.m.-I get my sweat on at DASH Fitness. Thursday morning is Body Combat class! I love starting my morning with a good workout. 7:15-I eat breakfast-a bowl of oatmeal with banana slices, cinnamon, and a splash of milk. 7:30-Caleb wakes up. Josh and I fight over who gets to grab him from his crib:) I feed him for the 2nd time and catch up on what’s going on online via my iPhone. 8:00-Josh changes Caleb and puts him in his swing. Josh leaves for work. 8:15-Caleb usually talks for about 15 minutes in his swing and falls asleep. I get to work while he is napping. Nap time is coveted time these days:) I respond to emails, edit photos, and write my blog post for Friday. 10:15-I get lucky and Caleb takes a 2 hour nap! Yay! I feed him again and get him dressed for the day. 10:45-It’s play time! Caleb loves to play on the floor with his toys. 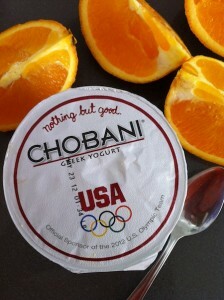 I grab a quick snack-Chobani yogurt and an orange. 11:00-Caleb gets bored on the floor, so we head outside for a walk. 11:30-We are back and it’s time to change Caleb again! 11:45-Caleb is hungry so I feed him lunch. This time he gets rice cereal with avocado mixed in. 12:30-I hurry and grab a quick lunch. I make a Smashed Chickpea & Avocado Salad Sandwich-my favorite lunch:) I catch up on emails, Twitter, Facebook, etc. while I eat. 2:00-Caleb eats again and falls asleep while he is eating. I carefully move him to his swing so he can take a nap. He sleeps much better in his swing during the day. 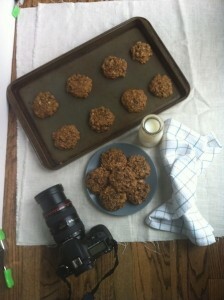 2:15-I get busy in the kitchen and whip up a batch of cookies for the blog. 3:00-Caleb wakes up when I am in the middle of taking photos. I grab him, change him, and let him play on the floor so I can finish up. 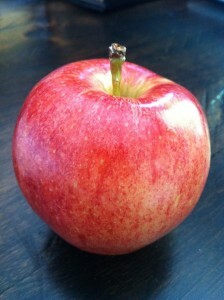 3:20-I grab an apple and a few pretzels for my afternoon snack. We go on another walk. 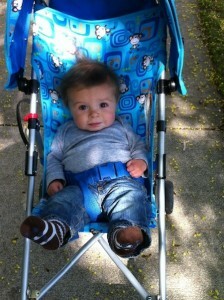 Caleb loves to be outside! 4:30-We sit outside on the porch waiting for daddy to get home from work. Caleb loves to watch the cars go by. 5:00-Daddy gets home! Daddy changes Caleb (had to do an outfit change too) and plays with him while I get dinner going. 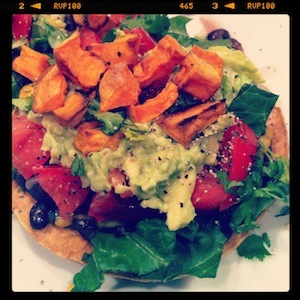 I make one of our favorite meals, Black Bean Sweet Potato Tostadas. 5:45-We sit down and eat dinner together. Caleb sits on daddy’s lap while we eat and we talk about our days. 6:30-We go on a family walk around the park. 6:45-Josh and Caleb swing together-one of Caleb’s favorite activities. 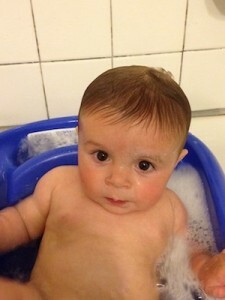 7:00-Bath time for Caleb, probably his favorite time of the day. 7:15-Naked time before bed. We let Caleb roll around in his diaper before bed. He loves it! 7:45-We put Caleb in his pj’s and I feed him. 8:15-Bed time for Caleb! We both put him down and then grab the monitor so we can spy on him. He talks for 5 minutes and then falls asleep. 8:20-We turn on the T.V. I am behind on my Grey’s, so I let Josh watch whatever he wants:) I head back to the computer to catch up on blog stuff! 9:00-I eat my favorite bedtime snack-a mug of cereal. 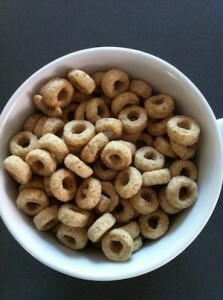 Tonight it is Honey Nut Cheerios:) I browse Pinterest while eating. 1:16-Caleb wakes up for a snack. I feed him and go back to bed! So nice to read this post and that you adore being a mother and what a cutie Caleb is! Josh is obsessed with TED talks! Our hubbies need to meet…and so do we! I love getting a glimpse into other people’s lives! That was a fun read! Thanks for sharing, and Caleb is just a doll! busy full day I wish mine had napped that good. they took 1 nap a day (it was 2 hours). They did crash at 7 though , course I wasn’t far behind them 🙂 and up at 6am. all your food photos look so yummy off to check out the recipes. this is so fun! I love reading things like this 🙂 thanks for sharing! Love it! Thanks for sharing, Maria. I did wonder too how you do it! I have oatmeal with cinnamon and raisons almost every morning, and am thinking I’ll have to try it with bananas tomorrow…Mmm. Btw, admire you for getting up to work out every morning! 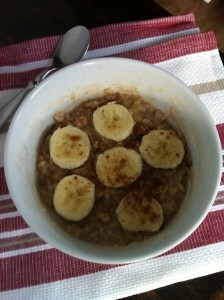 I love cinnamon and raisin oatmeal too:) Yay for oatmeal! I loved this! Wish I could go back in time to when my 3 were babies! I think 7-8 months old is the best! 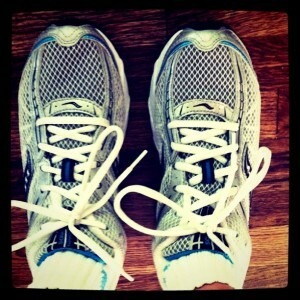 I am envious that you have the drive to get up at 6 am to work out! Caleb is truly out of this world cute! 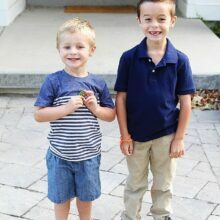 Oh, I do miss my boys being little. It goes by quickly, believe me! Mine are 21 and 19 now, and I swear they were just little tykes… yesterday. I can see that you’re cherishing every moment! Lucky gal, you! Loved this post. Behind-the-scenes things are such fun. 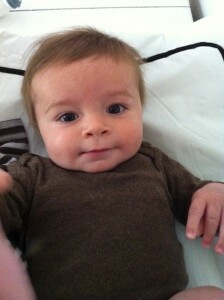 Btw-your little guy is a dreamboat! 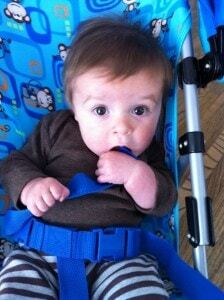 When my son was a baby he loved sitting on the porch swing too! We also have family walks almost every evening. I love them! 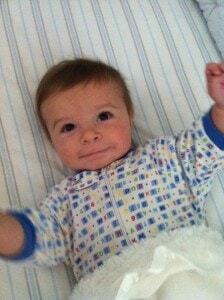 Count your lucky stars because my child never slept!!! Ever. Envious. GREAT post! I love reading “a day in the life” type posts….makes me feel more normal. You should write these up every 6 months to see how your life changes! You really are super mom and your son is SO adorable with those big eyes and smiling face! 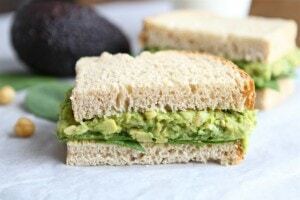 FYI: I’ve had the avocado/chickpea sandwich three times in two weeks! My little Olive likes it, too. I have really lovely your posts recently. Caleb is just beautiful. I bet you could spend all day looking at him. Great pictures of your cute baby boy. Do you have any tips or recommendations on starting a new blog. I just started at the beginning of this year and I’m gettingvisits (thanks to the ease of marketing with social media these days), but I want more 🙂 How long did it take for yours to get as successful as it is today? Thanks! I love this update in the life of you (and y’all) 🙂 Thanks for sharing it! LOOK at that cute little face!!! I love his hair! 🙂 You are one busy mama! Thanks for sharing this little look into your day. Busy day! It’s amazing what we do in an average day! Your son is just so cute! Wow! All I can say is that you are so lucky that Caleb naps so much! I am a fellow blogger and have a 3 1/2 year old who no longer naps (hasn’t since 2 1/2) and it is REALLY hard to find time to get my work done. Enjoy all this nap time while you can! 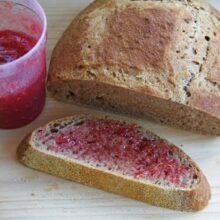 Thanks for sharing a typical “day in the life.” I would love to hear about different food you make for your son, as mine has become quite a picky eater! Might give me some new ideas of things to make for her. He doesn’t nap this well every day, but he usually takes 2 decent naps, one in the morning and one in the afternoon! Aaaah! He is too stinkin’ cute! Your day sounds exactly like mine. Even the part about grabbing baby out of the crib and letting him/her play so you can finish up shooting food 🙂 Love this post! I may have to copy your idea because I get asked that question all the time too! Very similar to my days while i am home with little Ella!! 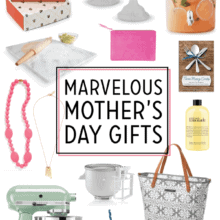 But while i am on maternity leave i also do lunches with moms, playgroups etc. Love staying at home. But i have to go back to work in a few months. Right now i am loving it though. We get out somedays too. Caleb loves being around other kiddos! Hope you are doing well! Caleb loves “naked time.” 🙂 Can’t wait for you to meet him! yep! That’s a busy day making every minute count! Great job and plan. WoW, you sound like me. You are amazing. Oh Maria- I forgot so quickly how that baby stage is- it is just quick little bursts to get things in between naps. 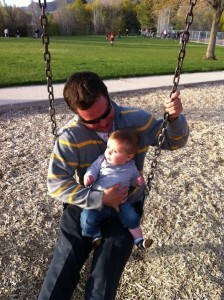 (My first LIVED in the swing by the way!) I’m afraid it doesn’t really get past that schedule- the bursts are just for different things other than naps, like coloring or barbies! It is a pretty crazy life to be a mom that works at home and watches the kids- but it is so worth it not to miss that time when they are little. I love “day-in-the life” It is always cool to see how other people live! Love day in the life posts. Caleb is such a little cutie! I have been a stay at home mom for about a little over a year now and I am so blessed and thankful to have the opportunity to be home with my kids when they are small. Even though some days I want to pull my hair out. What a great way to share your life. Caleb is so precious! Sounds like a great, productive day for everyone! 🙂 My little 9 month-old, Gabriella, will not lay in her crib and fall asleep like your little Caleb! How in the world did you manage to get that routine down? I can’t believe you get anything done with all of the feeding and changing and walking and playing. Yow! It’s been a long time since I’ve had babies to care for, and I had totally forgotten how many times a day they eat! The difference for us was we had no phones or iPads to play with while feeding them, so I think I just sat there! Delighted to read about your day with your handsome boys! 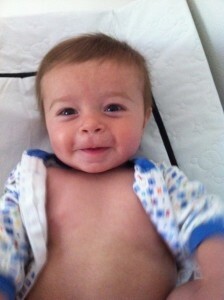 Caleb is honestly THE CUTEST baby I’ve ever seen! What a JOY it must be sharing your days with that little bundle of HAPPY! LOVED this! You are a great momma. Aw, I loved hearing about your days with Caleb! You can tell how much you love him and how much you love being a mom! great post. I it all sounds familiar even though my kids are older. You do a great job at all that you do! You are living my dream life right now! 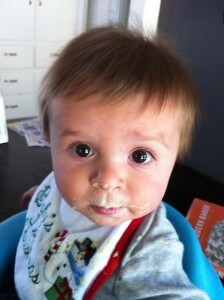 Caleb is A.DOR.A.BLE I would love to one day have a little babe of my own and be able to blog as a full time job! I’m half way there, I only work at the real J-o-B 2 days a week and blog the rest of the time, but lets face it…I’m not racking in the dough… just rollin it out to make cookies. What a fun glimpse into your day! Love all the food you got to enjoy….all looks so healthy! Love this! Both my littles took swing naps for a long time – they loved it there. And wow! Early morning workout. I’m impressed, really. Thank you for sharing! You are doing a great job, Maria. We are so blessed to have such great husbands to help and to also get to do our “jobs” from home. Wow, I forgot just how busy life is, with a baby! Makes me wonder how I did it when my kids were younger. Of course, I was younger, too. I loved getting into your day. I loved this post! Caleb is so cute & you are very efficient. I love reading how other people pass their days – thank you for sharing. Fun! I love posts like this! Staying up after his 5 am feeding so you can workout!? I admire you! Love it – I remember those days when my kids were babies and wishing my Julian was around so I could enjoy that time with him the same way. ENJOY every moment!!! All I have to say is that you are amazing! This is great Maria! You are extremely efficient in getting things done when you have the time and that is the key when you have a little guy. I’m so glad I got some time with all of you last week. Those tostadas need to happen in my house very soon 🙂 love ya girl! Love it! Been there and it goes so fast. Soak up every cute smile and moment. He is really cute. I love your blog! 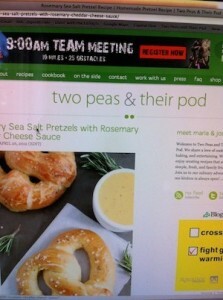 I just found your blog from Mama Pea and I’m so glad I did. I love reading about Moms who put their heart and soul into it.